Beaujolais natural wine t-shirt - Apathynow & Vindal - Design, Illustration, Murals, Wine design and wine t-shirts. 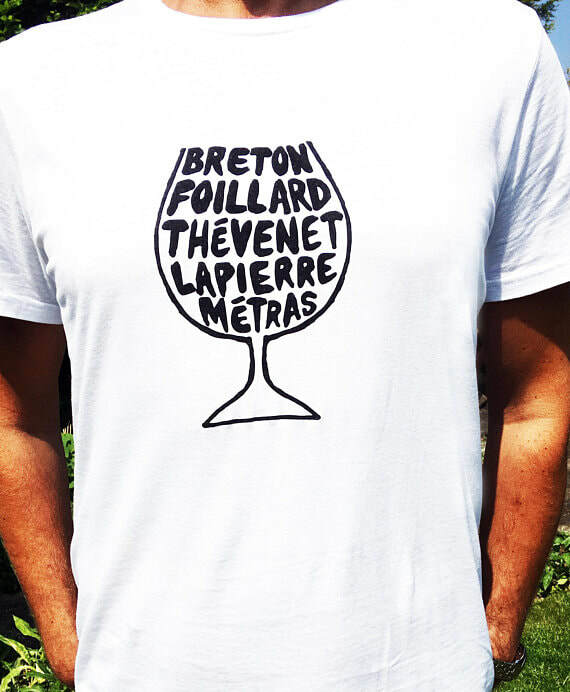 White quality cotton t-shirt with flock vinyl unique design: Wine glass filled with Beaujolais: Guy Breton, Jean Foillard, Jean-Paul Thévenet, Marcel Lapierre, Yvon Métras - Natural Wine Makers. Unisex Heavy cotton style T-shirt and women's soft style ring spun t-shirt style also available. See Size Chart Image for actual t-shirt measurements. Wash and tumble dry inside out on a low/medium setting. Gently iron on reverse of design.